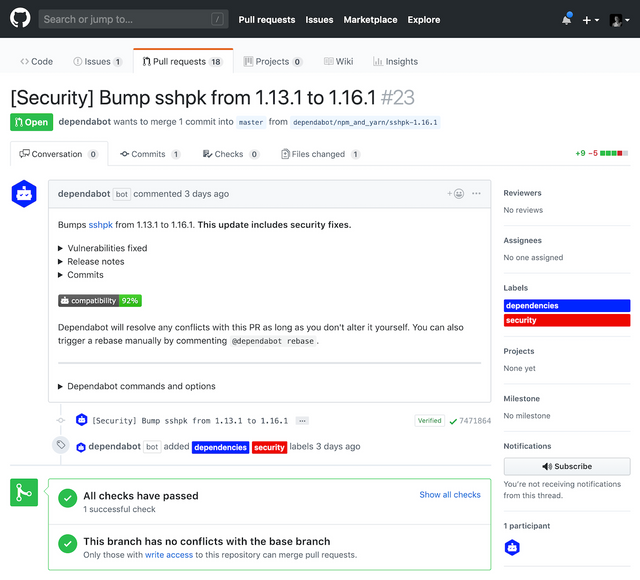 Dependabot creates pull requests to keep your dependencies secure and up-to-date. pull requests merged, and counting! Dependabot pulls down your dependency files and looks for any outdated or insecure requirements. If any of your dependencies are out-of-date, Dependabot opens individual pull requests to update each one. You check that your tests pass, scan the included changelog and release notes, then hit merge with confidence. Dependabot PRs include release notes, changelogs, commit links and vulnerability details whenever available. They also automatically keep themselves conflict-free. You can configure Dependabot via an online dashboard or commit config files to your repositories with details of how Dependabot should behave. Choose to receive update PRs live, daily, weekly or monthly. We make an exception for security patches, which you'll always receive immediately. ... plus more, who have merged Dependabot pull requests. Dependabot is a GitHub integration, so you can try it on a single repository. Set up takes less than a minute.